A Kids Red Wise Man Costume including a Tunic, Jacket, Belt, and Hat – Ideal for Christmas, a Nativity, or any fancy dress occasion! Get ready to celebrate this Christmas with this brilliant Kids Red Wise Man Costume. This Kids Red Wise Man Costume comes complete including a Tunic, Jacket, Belt, and Hat. This simple red long sleeve Tunic combined with the green velvet sleeveless Jacket, which features a decorative gold trim, will be sure to make you stand out amongst your fellow Wise Men! Complete this Kids Red Wise Man Costume with the rope Belt, and Hat with a red and gold crown design. Perfect for a Christmas Party, a Nativity, or any festive fancy dress occasion, this Kids Red Wise Man Costume will be sure to impress! So let the celebration begin with this fantastic Kids Red Wise Man Costume. Available in sizes Small, Medium, Large, and XL. 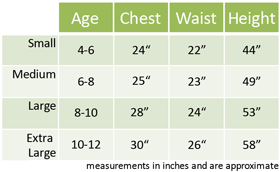 Size guidelines: to fit UK ages 4-6 years, 6-8 years, 8-10 years, and 10-12 years. A Kids Red Wise Man Costume.